If change was a fire, then a small piece of tinder has been lit! And I’ve just smelt the smoke! The fire has started deep in the heart of Africa, in the country of Botswana, and it goes by the name of Botho. Botswana is governed by five national principals, democracy, development, self-reliance, unity and Botho. Botho is a philosophy that the people of Botswana follow. It is based on a number of important things: Mutual respect, responsibility, compassion and realising your full potential as an individual and as part of the community you live in. The people of Botswana practice Botho everyday, at school, at work, at home and in their local community. They think about the decisions they make and see if they are good for others and not just for themselves. You cannot live Botho alone. Botho is all about working together, about doing what is best for the community and not just for yourself. I think that Botho holds the secret for the world living in peace and harmony. That is what it is all about, unity and in unity we have strength to stand up for what is right. I challenge you, people of the world, to think about Botho and how you can apply it to your own life. I too am going to think about it. How can I apply it to life in my own little community: my family? We, as a family, feel like we already try to follow some of the principles of Botho. I am going to explore it even more, so expect more blogs about it. As I journey I will share my thoughts . My final destination is to live Botho. Tell me what you think in the comments, I’m really keen to know……. 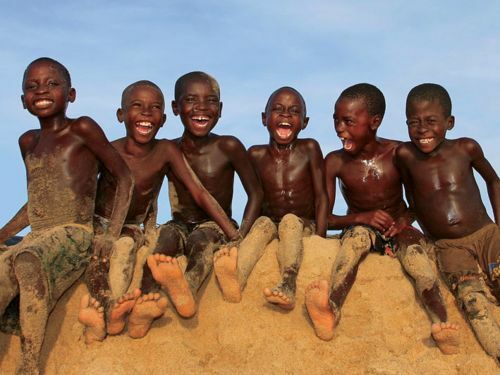 They don’t have a lot of things or a lot of money, but they have Botho and that makes them happy! One family found the philosophy so important that they named their child Botho. 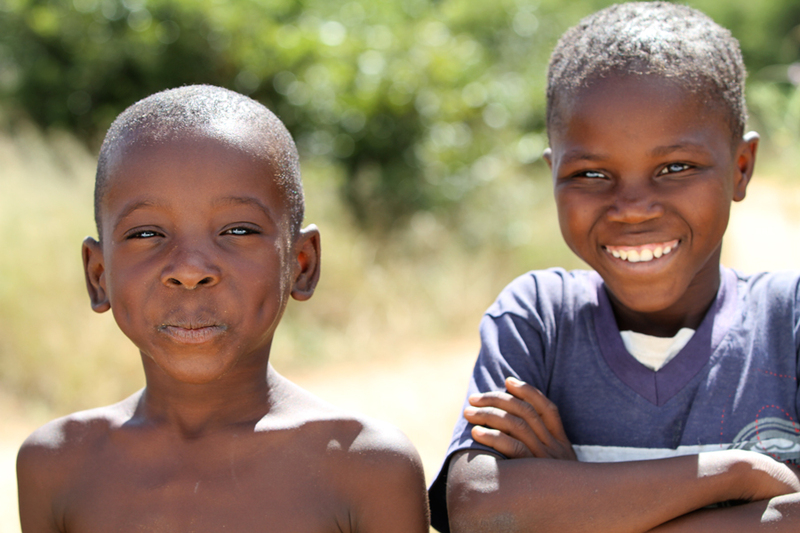 Caring about others is essential for the people of Botswana. They believe that it is important to do what is best for your community. A long time ago, in a country called Afghanistan, there was a battle. The battle was between Afghanistan and England. Afghanistan was losing. Amongst the masses of slain soldiers, sat an Afghan girl. She looked up and saw her people running away. Slowly she rose to her feet, she climbed to the top of the highest mountain. Here she spoke up, the words poured out of her mouth, loud and clear and brave. ” It is better to live for one day as a lion, than to live for a hundred years as a coward”. The people were encouraged and they turned to face the English. The girl stood at the head, holding the flag. 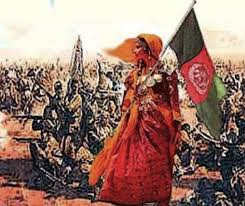 Her words had made the men of Afghanistan strong and they won a great victory that day, but as the English went to ride away, a man looked back over his shoulder. He pulled out his pistol and aimed. The girl fell, dead. Her name? Malala. Over a hundred years later, in a small village in the Swat valley (Pakistan), a baby girl was born. Her father was a teacher and a wise and good man. When his daughter was born he knew he had found his soul mate. She would grow up to be an incredible girl, ordinary yet extraordinary. Her father knew it, he named her Malala. 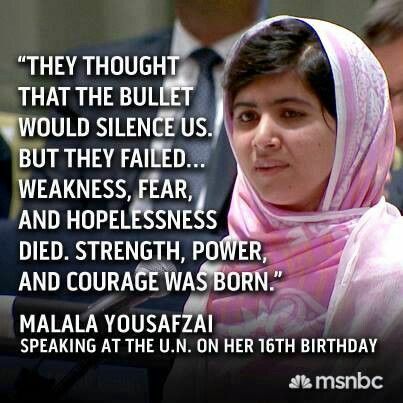 Malala is seventeen now and has become one of the world’s greatest and most amazing young women. She has campaigned for girl’s education all over the world. She has met with world leaders, written a book and produced and starred in her very own film ( Which I have just seen and it actually inspired me to write this blog) and won the nobel peace prize. All of this was to work towards her goal: every child shall get an education. Malala was just an ordinary girl, but her love for education and her determination has made her extraordinary. But how has she got here? What and who has made her who she is? What has been her journey? Malala and her father spoke out against the unjust laws of the Taliban. They put their lives in danger. 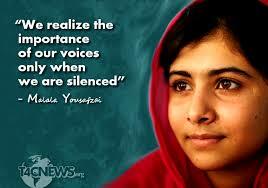 Malala’s father said ” I would rather die than live another day in silence”. They were brave and they did what was right. Malala when she was no older than me! But Malala paid dearly. 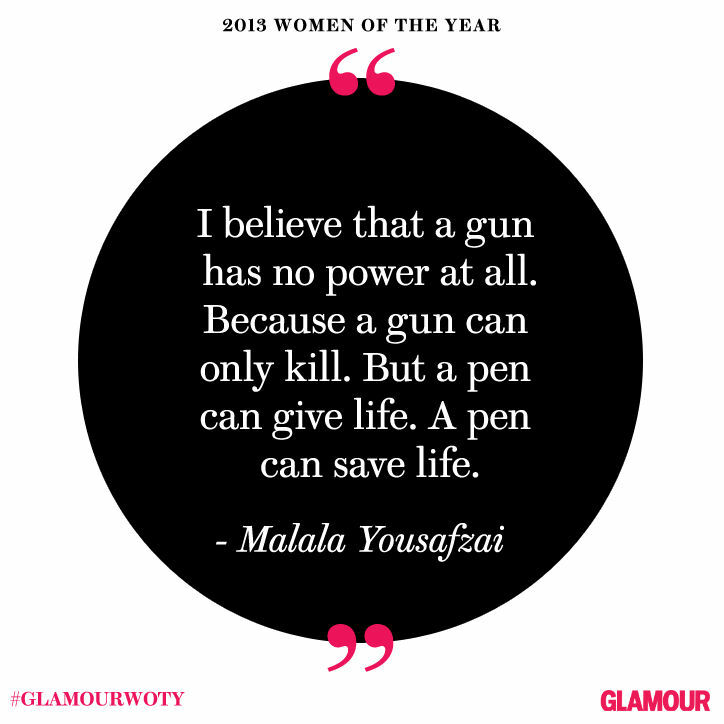 One day, in the school bus, Malala was shot in the head by the Taliban, along with two of her friends. The other two girls where not too badly injured, but Malala was. No one thought she would live, but everyone prayed for her. Praying the hardest, were all the girls she had stood up for. She was taken to hospital in Birmingham and here she made a long, slow, but miraculous recovery. But Malala was sad, never again would she see the valleys of her home land. If she returned, the Taliban would kill her. 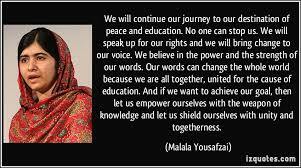 Malala has inspired me a lot. 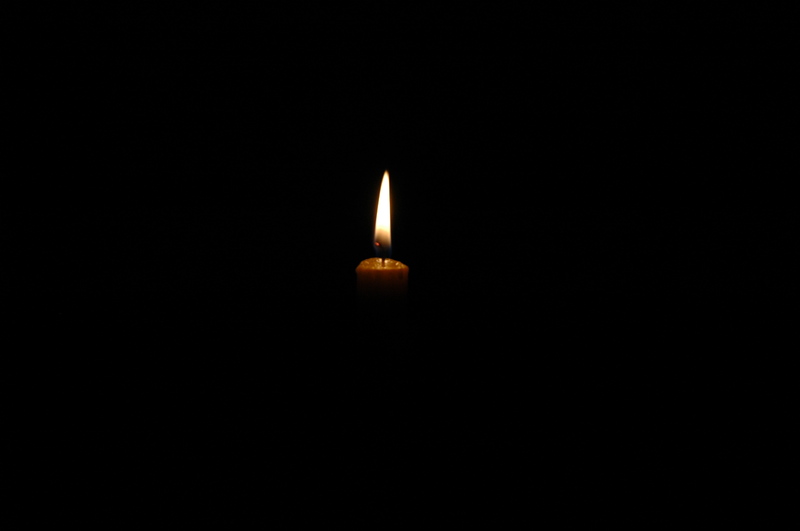 She is what I want to be: A light in the darkness. Malala is a girl who was passionate about something and look how far she has come! From a small child living in a remote village to a nobel peace prize winning activist! She first started speaking and standing up when she was just eleven years old. I am almost twelve. 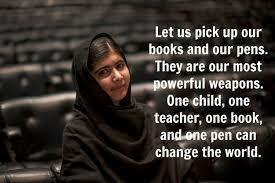 Malala is living proof that children can make a difference. She says that you should not doubt yourself and think you are uncapable of achieving great things because of your age. 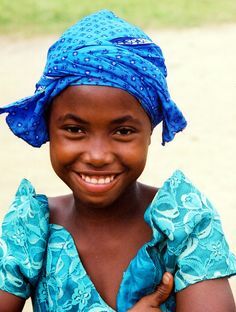 Children are powerful, they can be lights in the darkness. I struggle with being a light sometimes, it isn’t easy, but watching Malala’s film and hearing her story has made me more determined than ever. Even though I am a child, it does not make me any less able to make a difference than an adult. 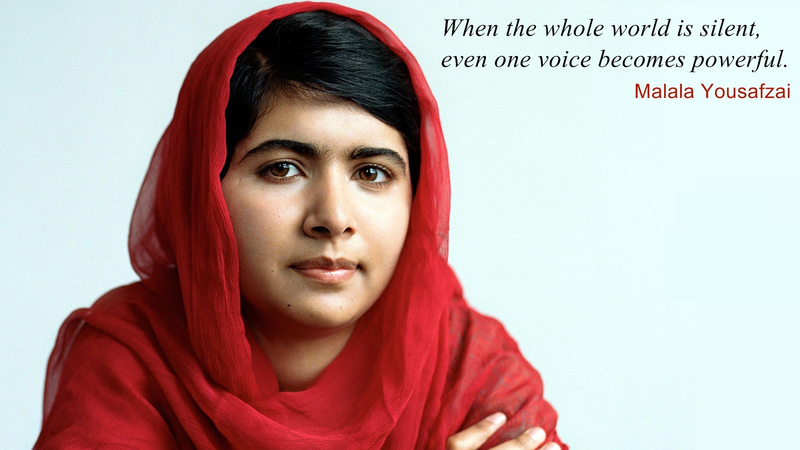 Malala needs all of us children to stand up for what is right. 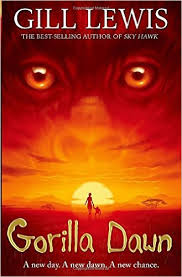 I have just read this really inspiring, eye-opening book called Gorilla Dawn. It’s set in the Democratic Republic of Congo, Congo has been in fierce conflict between armed rebel groups and the government soldiers for over two decades now. Gorilla Dawn is about the innocent people that get caught up in this hostile fighting, especially children. It is also about how greed can affect everyone. Rebels take children to become soldiers in their camps. The children are trained to be killers, yet at heart they are only kids. They do not want to fight, their only wish is to have peace. They should be at school and playing with their friends. This is Imara, the main character of the book. 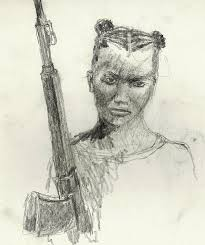 She is a child soldier and war has affected her life greatly. She has been left with deep scars, emotionally, physically and mentally. These armed groups need to be stopped, but how can this be done? Well, there is one way………. Government troops are funded by the government, but how do the rebels get money? Deep in the forests, buried underground, there is a mineral: The key to the rebel’s wealth. This mineral is called tantalum and it can be extracted from coltan ore, which is found abundantly in Congo. Tantalum is very precious, it is needed in all electronic devices, it is mostly used in mobile phones. So the rebels dig mines, or rather the rebels get the children to dig mines. This is extremely dangerous, but the rebels don’t care. The children are often killed in these mines, it is not uncommon that they die of exhaustion and hunger too. They work so hard for so long with so little food. The mining also affects nature because the mines are dug on the reserves that are their homes. The gorillas, like in Gorilla Dawn, are put in danger. The brave rangers daily risk their lives to try and help all of the nature that the mining destroys. 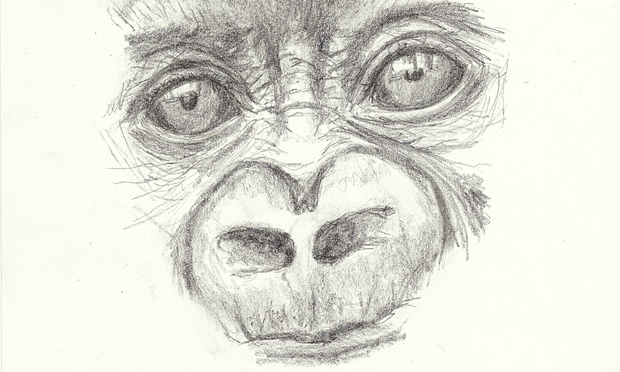 kitwana: Imara’s gorilla. He helps her to discover her real self and come away from the tough, screwed up child that she has become. Before she meets kitwana, Imara believes that she has the devil inside her. The baby gorilla makes her realise that she is a beautiful, innocent child. Not a soldier. You cannot close down all the the mines, because there are many conflict free mines that provide the Congolese with work and allow them to support their families. Tantalum mining is the main industry in Congo, you cannot just stop it. These mines have been made safe, with open mining areas instead of tunnels. Money has been spent on safety equipment because people care. So a law has been passed, all U.S electronics companies must report to the U.S Security and Exchange Commission what tantalum they are using and provide proof that they are not fuelling armed rebel groups. This is a big step towards achieving peace in Congo, because the rebel groups are losing money. 1. When you next buy a new electronic device think about what company you buy it from. Some are more supportive of the conflict free tantalum cause than others. Do a bit of research and find out what you can. Some of the best companies include: Intel, HP, SanDisk, Philips and AMD. Some companies you may want to avoid include: Nintendo, Sharp, Nikon and Canon. 2. Make your voice heard! Tell your friends about conflict free tantalum! 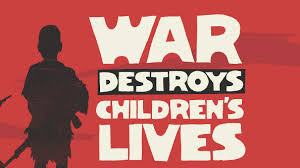 Tell your friends about child soldiers! Talk to your teacher about it! The more people who know, the better. 3. Read Gorilla Dawn. You will be as inspired as I was when I finished it. 4. Adopt a gorilla at WWF, they use your money to help the rangers protect these wonderful animals. This motto says it all. 6. 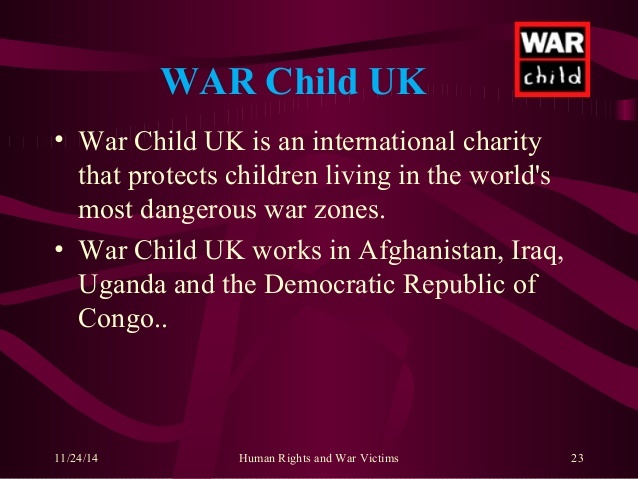 You can get the War Child School Officer, May, to come and visit your home ed group or school if you live in London or the sorrounding area. Just contact her on the War Child website.